Bolivia is a fascinating country, tucked away in the heart of South America. Perhaps because of its notoriously inadequate and often dangerous road systems and frequent political unrest in recent years, travellers often bypass it. However, those who are willing to activate their intrepid natures will encounter exciting adventures and be rewarded with breath-taking sights, sounds and smells. With a population near that of New York City, and a geographic area similar to the size of France and Spain combined, Bolivia is a miniature melting pot. Its multi cultured populace often simmers with ancient rivalries that still exist between the different cultures. The largest percentage of the population comes from the indigenous groups of Quecha and Amayra decent, both from the Altiplano region. The lowlands house several groups such as the Guarani and the Ayores, that have their own distinct language, as well as culture. Small tribes whose languages have only recently been recorded in written form still inhabit the jungle areas. The Spanish influence of the Conquistadors certainly is demonstrated in the traditional ruling class. Small pockets of European descendants, such as those from Yugoslavia and Croatia and communities of Middle Eastern origin, specifically Lebanon and Palestine, combine to make the flavours even more intense. During the 1930’s and 1940’s Bolivia opened their borders to receive war refugees from countries such as Germany and you will find small close-knit Jewish communities in most of the major cities. In Cochabamba, the local English-speaking woman’s club, a charity organization, which has been in operation for over 60 years, holds their monthly teas in the Jewish Community Center. Ironically, some of the most notorious of the Nazi also found refuge in Bolivia. In recent years, groups from Taiwan, China and Japan have established their influence and, of course, opened up popular eating establishments, adapting their recipes to locally available ingredients. Remnants of the Mennonites are located in the Santa Cruz region and are well known for their cheese making. Bolivia is unique in that it has two capitols. Sucre, the official capitol is where the Supreme Court is located. La Paz, the administrative capitol, continues to push its burgeoning populace up the sides of a small valley on the high Andean plateau. Mount Illimani rises out of this dry, cold desert and provides a year around vista of snow-covered mountains. One speaks literally when saying “breath taking beauty”, as visitors often must avail themselves of oxygen provided in the airport due to the altitude. At approximately 12,000 feet it is the highest commercial airport in the world. Other breath taking experiences can be had by travelling to the jungle areas of the Yungas to visit their recently acclaimed coffee plantations as you must take the road to Corioco, often described in travel guides as the most dangerous road in the Americas. Its vertical scenery is impressive as one drops about 3000 meters in less than 80 kilometers. A perhaps safer road will take you across the flat plateau where you can visit Oruro, usually a very dull, brown town, except at “Carnival” time when the city is filled with color and excitement as thousands gather to dance hours dressed in elaborately decorated costumes that can weight more than 50 pounds each. Our next stop might be through rugged mountains again with our destination the valley city of Cochabamba. Once a sleepy, Colonial style town it is now a metropolis of more than a million people. Bolivia is often called a land of contrasts because one so often sees the evidences of the past Spanish colonial influence of many different eras juxtaposed next to the latest architecture of the 21st century. The shiny glass and metal structures, which many Bolivians take such pride in, might tower over a neglected tile and stucco home perhaps from the 17th or 18th century, of which most North Americans would stand in awe. One great mystery is how they were able to transport the beautiful crystal chandeliers, massive European furniture and delicate fine china that furnished those homes. Most of it was brought over incredibly dangerous roads on wagons. No doubt with the help of some of the famous, sure footed llamas. The lifestyles of the many different centuries represented here can be encountered within one city block—a hurried business executive talking on his cell phone rushes by a simple woman in native dress selling fruit from the concrete walkway. Even though she may still use the typical full skirt with many petticoats and blouse, styled after the Spanish fashion of centuries ago and use a hand woven cloth made with natural dyes to carry whatever burden she has—whether it is a newborn baby or her wares of fruits and vegetables- she might go home to watch on T.V. the latest episode of a popular “novella”. The introduction of television in the last 30 years has brought many out of the past of 400 years ago into the 21st century at almost the speed of going through a time machine. Unfortunately, not always bringing better lives, sometimes just a recognition that they don’t have much of the material things most of us take for granted. Continuing our journey across Bolivia we leave Cochabamba and head toward the jungles of Chapare. The change in topography and climate in such a short time, total of about 3 hours, is something to experience and each time you have the same impact. Imagine going up from a beautiful, green valley into some very steep mountains, but with a patchwork of mulitcolored fields of all kinds of farming, potatoes, beans, onions, squash, etc. Each field a different shape and color and many extending almost to the top of the mountain. Suddenly, you are driving through clouds. When you start down on the other side the greenery changes almost immediately from pines and eucalyptus to the ferns and plants of the jungles. Soon you are in the hot, sticky climate of the jungle. Orchards grow wild by the roads. Other exotic flowers such as the Emperor's canes, tall stalks topped by a waxy, almost plastic looking flower in soft hues of peach, yellow and a wine red surprise your eyes. If you venture off the main road you will find what you imagine the jungle to be like -- hundreds of kinds of green foliage everywhere, ferns, palms, vines with big and little leaves, some round, some pointed, others slick or fuzzy. Some cascading down likes waterfalls. Then there are the birds and more flowers, and butterflies and such silence --until a group of monkeys swing by, with their curious interest in the intruders. One of the big contrasts is the difference in the cultures and their native dress. The mountain people are shepherds and farmers and wear wool-clothing year around because it is always cool or cold. An hour away the people dress in shorts and light clothing and suffer from hot, sultry weather most of the time. Perhaps this is the basis for much of the social conflicts. They have such different outlooks and needs, but most, except the few elite, have a common fate of stark poverty. The sounds of Bolivia can range from the hauntingly beautiful strains of the “quena”, a reed flute, that can produce music from the likes of “El Condor Pasa” to classical and, of course, the native Andean music-- all the way to the jarring, clanking sounds deliberately made by the gas trucks vendors to advise local housewives that they can come out to purchase the gas bottle canisters most use for cooking. Bolivian law doesn’t recognize noise pollution so one must contend sometimes with all kinds of noise in the day and often into the night and early mornings. Eventually, you learn to tune out the most irritating ones and appreciate the more mellow sounds that echo the rhythm of daily life. Fireworks are popular expressions of festival celebrations and there are many, often of some type of religious nature. The really informed and discerning can tell whether the explosions are just festive fireworks or actually sticks of dynamite being used by political protesters to announce one of the frequent blockades or protests. Smells do really incredible things to our minds. We associate so many memories to them, some good, some bad. Bolivia is full of both kinds of smells. The wonderful aroma of street foods are so tempting, but I never allow myself to submit and have been rewarded with little experience of the famous Montezuma’s revenge type. And, knock on wood, no typhoid, although I did experience a serious bout of hepatitis years ago. All of these illnesses can be avoided if a little caution is taken…but those aromic smells!!!! “Anticuchos” which are kabobs of beef heart, treaded with pieces of roasted potatoes and onions, marinated in some mysterious sauce are found on many street corners. The famous pork “sandwich de chola” produces another great smell. Legs of roasted pork are hung on display and sliced away at until all is gone. The meat is put on a bun with a salad of onion, tomato and a special herb called “quilquena”. There are legitimate restaurants that make these as well, so one can enjoy, without the fear of food poisoning from unrefrigerated ingredients. 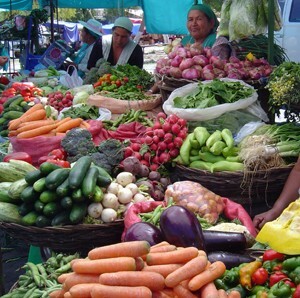 One of the many pleasures of living in Bolivia is the outdoor market. Most cities and towns have permanent fresh produce markets, sometimes under cover, but often on your visit there the “bad smells” of rotting foodstuffs overpower the pleasure of seeing such fresh, beautiful, colourful fruits and vegetables. Where I live in Cochabamba and in other cities as well, there are the special neighborhood outdoor markets, which are set up on a closed off, clean, paved street for one morning a week. Local vendors bring in their products and it is an array of some of the most wonderful ingredients any true cook could desire. The ancient Incas cultivated the first potatoes and there have been more than 200 different types of potatoes registered by agronomists in the area. Although you won’t find near that many at the market there are quite a few to chose from. The potato is naturally a stable of the diet. Also, the jungle areas produce many exotic fruits, such as several types of bananas –the small, chewy kind, the big reddish skinned ones called the Apple Banana, the “plantain” or cooking kind, and the regular ones we would find in the US supermarkets. There are also coconuts, mangos, cherimoya (sometimes called apple custard) tumbo, maracuya, and guayava (all of which make up into marvellous ice creams) besides the normal fruits most of us are familiar with. 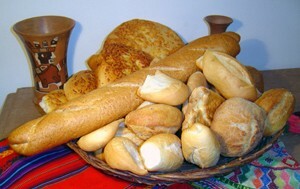 Some typical Bolivian foods can be bland and often are served with both potatoes and rice. But there is always the “llagua” on every table available to spice it up. This is a fresh, raw sauce made with tomatoes, onions and VERY hot peppers called locotos. Spooned lavishly over the food and often on the table bread while waiting to be served it is the Bolivian equivalent to picante sauce. Soups are a very basic requirement in many families still. Someone said there is a different soup for every day of the year and although I can’t actually vouch for that, it is certainly possible. One of my favorite soups is the peanut soup. Some of the poorer families may only have a rich, thick soup with bread. Others might start the meal with soup and then have an entrée, salad and desert. A popular salad is “Papas a la Huanciana “, but there is always a constant debate whether it is truly of Bolivian origin or Peruvian. Since Bolivia and Peru were once one territory, it seems like a mute point to me. It is made of boiled potatoes, garnished with fresh tomatoes, sliced boiled eggs and olives, and covered with a thick, hot/spicy peanut sauce. Dishes which are somewhere between a soup and a stew are also very traditional. Fricase is a typical dish which is often served after festive parties, translated -when there has been a lot of drink--such as a New Year’s Eve party. It is from the Altiplano area of La Paz, but is popular everywhere. Sometimes it is served as a “platito”, meaning a small bowl of food, at mid morning. Desserts are usually simple. It might be fruit or some type of pudding or gelatin. 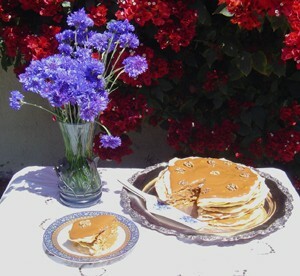 Cakes and cookies are not as sweet as American recipes and I find are often too dry or course textured for my taste. Bolivians love to frost their cakes with pure whipped cream. Meringues with whipped cream and fresh fruit added are also popular. Teatime is a very traditional event in Bolivian society. Offices are required to provide something for employees in the late afternoon if only an empanada and coffee or hot tea. If you are lucky enough to be invited to someone’s home for tea, it could be an elaborate affair of sandwiches, empanadas (meat or cheese filled pastries), cookies and cakes or it could be a more rustic meal of cold cuts and fresh breads, served with local farmer’s cheeses and marmalades. But it is guaranteed to be filled with lots of laughter and conversation. Bolivians are very social and always interested in getting to know foreigners, and love to practice their English. Another very typical traditional food of Bolivia is the saltenea, which is a juicy, savory, meat pie in flaky piecrust type dough. This is usually eaten mid morning as a snack. They are sold on the streets and in small cafes, where people either have one on the go or stop for a quick coffee. Ava Kelly Pereira (apereira@entelnet.bo) a native Texan, is a former owner of a fresh pasta company and take out eatery and member of the Houston Culinary Guild . She also co edited the cookbook , Cocinando en Cochabamba, and is currently living and teaching in Cochabamba, Bolivia.